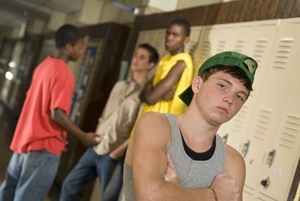 One of the most challenging aspects of fatherhood can be dealing with angry teenagers. Adolescents can be cranky and uncompromising, verbally lashing out at you for the smallest inconveniences you may impose upon them. The hostility can really affect the overall atmosphere in your house, so it's best to address it head-on with some of these helpful tips. Knowing when to walk away is an important part of dealing with upset teenagers. While you should take each outburst seriously, you don't need to deal with it immediately. Think about it carefully and allow things to settle down before discussing it again. Teenagers deal with a lot of frustrations, and it's best to give them some room to retreat after getting angry. Don't follow them and demand apologies for their actions because it'll only push their buttons even further. Let them go for a walk outside or sit in their room for a while in order to calm down. As a dad, you're going to deal with a lot of instances of anger – both directly and indirectly – with your kids. But know that most of the time, they're not upset with you as much as they're just angry and choose to use you as a metaphorical punching bag. In the end, none of it's personal, so don't take offense – just listen and be there for them.